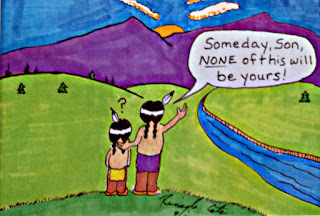 My introduction to Native American humor came years ago when we visited Canyon de Chelly in Arizona. It has been home to the ancestors of the Hopi and in more recent times to the Navajo Nation and is designated today as a National Monument. When we arrived with our son who was 10 or 11 at the time we decided to take the prescribed tour of the canyon floor. Together with all the other tourists we piled into the old school bus and waited for the tour to get underway. A group of Indians were sitting on a wall nearby and one fellow with his arms folded grinned at us and said, “Shake and Bake, shake and bake”. I must admit I did not quite get the humor until we started under way and rattled over the canyon floor in the broiling heat! Ricardo Caté is an Indian from Santa Domingo pueblo, today known as Kewa, 30 miles south of Santa Fe. 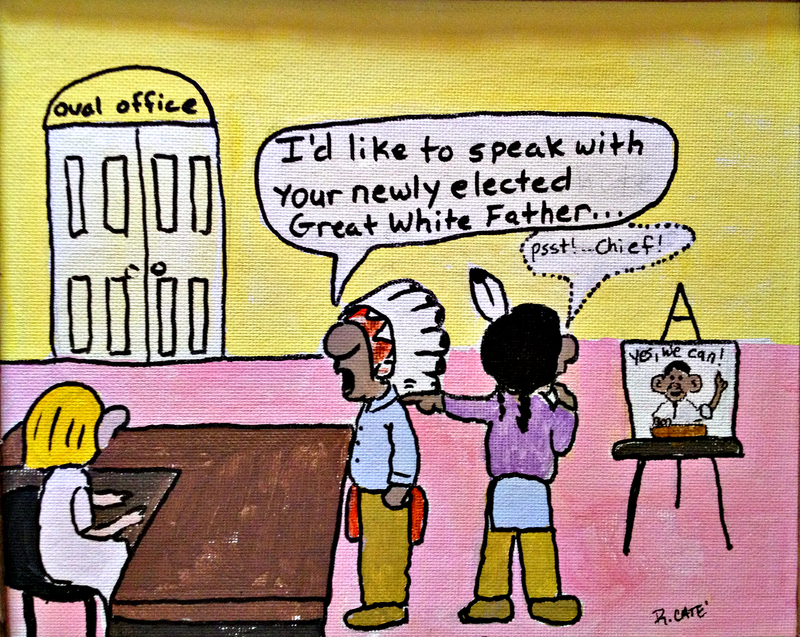 He is a cartoonist who creates a bridge between the Native American and Anglo cultures. His sense of humor comes out of his pueblo culture. It is partly cynical and partly satirical. 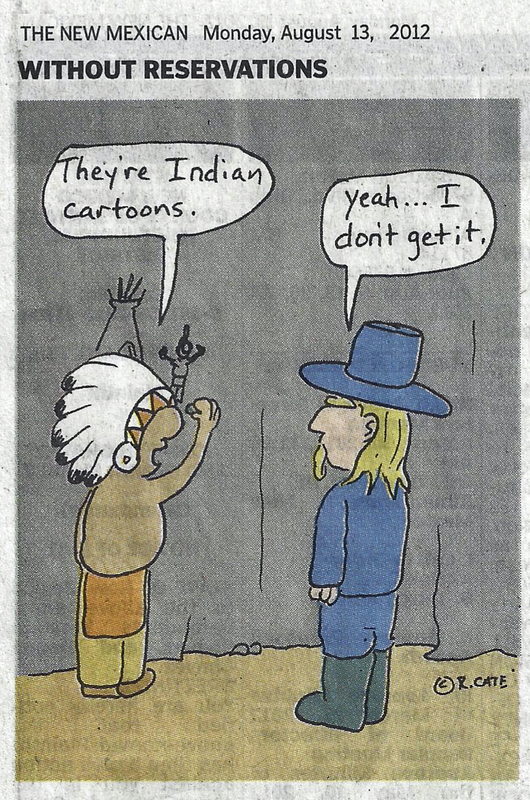 I must admit I don’t get every cartoon but that single frame which appears in the Santa Fe New Mexican every single morning sometimes has me clutching my sides laughing. In fact every once in a while a cartoon will inspire a letter to the editor from a well-meaning Anglo complaining that Caté is politically incorrect,. Some people just don’t get his view of the world. 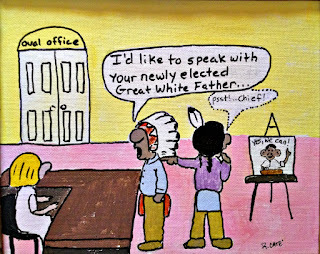 Of course, it helps to know where he is coming from but by now every schoolchild knows about the hardship Native Americans have suffered, much of it caused by the Anglos. And everyone is acquainted with how the Indian is portrayed in popular culture. Much of the humor has the same significance in our culture as in theirs. What child has not heard his elders complain about the remote control that came with the TV set or heard them talk about how there was no such thing in their day. So the image of the old Indian in his armchair with a broomstick to reach the channels is not foreign. Caté says he inherited his sense of humor from his Dad. Even in grade school he was drawing comics. Two of his favorite cartoonists were Don Martin of MAD Magazine and Charles Schultz of Peanuts fame. Caté’s work reminds me very much of Peanuts and the universal truths that come from that strip every single time. Caté, however, produces his zingers in a single frame making them even more poignant.. 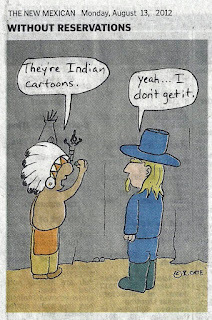 In 2006 Caté walked into the New Mexican editorial offices and asked if he could submit a cartoon for the daily paper and was told he would have to submit it through a syndicate. He much prefers the direct approach and kept insisting that they at least take a look. Finally the publisher agreed to look at the dozen or so drawings that he had with him. She started to laugh and called in her colleagues who also started to laugh and they finally agreed to reserve a place for his cartoon every single day. The challenge for Caté has been keeping to that fixed schedule but he has managed to do so for the past half dozen years. Sometime Caté does express his frustration with the encroachment of the U.S. government on Indian land, which seems to be a never ending battle. One such cartoon is this one. But more often it is done with a sense of humor that has struck a common chord in us all. Although he self-published a previous book and a calendar, the first book of his cartoons with a commercial publisher has just come out (Without Reservations, the Cartoons Ricardo Caté - available at Amazon.com) with general distribution that will make his work available to a much wider audience. What a cool profile! Thanks for sharing. We always love hearing about the talented individuals from our neck of the woods.